Joanne Sher: Editor/Proofreader : Monday Manna for October 5 - plus giveaway reminder! 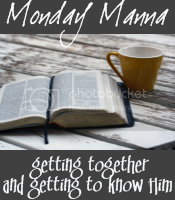 Monday Manna for October 5 - plus giveaway reminder! Just a reminder - I've still got my giveaway going on. All you need to do is write a creative caption for my very scary picture. There will be two winners - pop over to Tuesday's blog for all the details! You guys have definitely got me laughing so far! Deadline is Friday at midnight, with a winner announced Saturday. And now to the REAL reason for this post! This particular word picture from scripture has captured me ever since I became a believer, likely because of my background. There is so much depth to it, and I feel the need to ponder and meditate on it even more lately. Hope you feel the same way. I truly hope you will participate. See you back here on Monday! "and live..." I want to live in Truth-filled freedom. This should be a good one. Loves.